A former state legislator and attorney, Smith was first elected to Congress in 1996. Now the longest serving member of Washington's U.S. House delegation, his seniority has put him in a committee chair position for the first time. 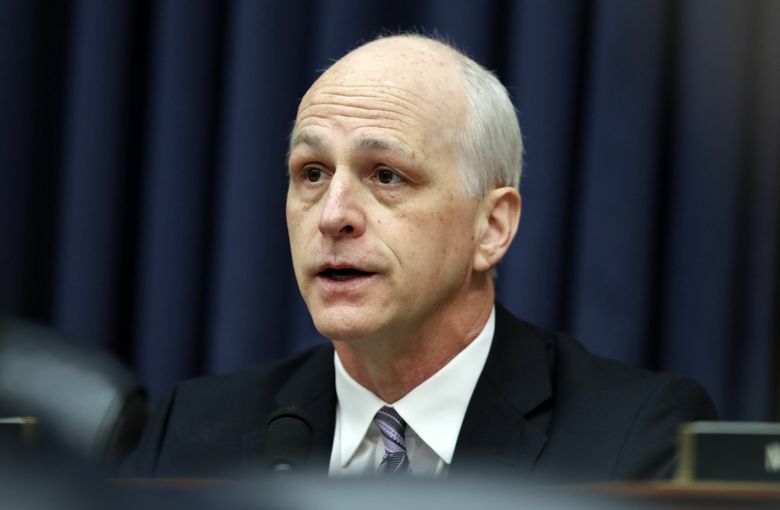 Rep. Adam Smith is less than a week into his tenure as chairman of the House Armed Services Committee, but the new position already has thrust the Bellevue Democrat to the forefront in the clash between his party and President Donald Trump over a wall along the southern border. With the federal government in the third week of a partial shutdown over the border impasse, Trump is threatening to declare a national emergency to unilaterally divert money from the Defense Department to build the wall. In an early Monday tweet, Trump cited a weekend TV interview in which Smith conceded the president may have the legal authority to shift those funds. But Smith, in an interview with The Seattle Times later Monday, slammed Trump’s wall obsession, saying that while the president has broad emergency powers, he shouldn’t use them for what Smith calls a manufactured crisis. “He wants to scare people about the hordes coming from south of our border. It’s rooted in xenophobia and racism and an anti-immigrant bias — it is not rooted in fact … He is trying to demagogue the immigration issue, and that is why the government is shut down,” he said. A former state legislator and attorney, Smith was first elected to Congress in 1996 and won re-election in November to a 12th term. Now the longest-serving member of Washington’s U.S. House delegation, his seniority has put him in a committee chair position for the first time. Smith assumes the Armed Services post at a difficult juncture for the Defense Department. Former Defense Secretary Jim Mattis resigned last month, in part over Trump’s decision to withdraw troops from Syria. The resignation sent shock waves through Washington political circles and the Pentagon, which is now led by acting Defense Secretary Patrick Shanahan, a former Boeing executive. In the interview Monday, Smith vowed to wield the committee’s oversight authority to hold the Trump administration accountable on issues that include overseas use of military force, deployment of troops to the border and wasteful Pentagon spending. On wall funding, Smith criticized the White House for a willingness to shut down the government without giving a detailed justification for the spending. He contrasted that with the 1990s government shutdown, when Republicans sought specific budget cuts from the Clinton White House. For his part, Trump, who pledged during the 2016 campaign that Mexico would pay for the wall, has stood fast on his funding demands and suggested last week the government shutdown could continue for months or years. The president planned a public address from the White House on Tuesday about what he calls a crisis, and scheduled a visit to the border later this week. Smith said his first hearing as Armed Services chair will look at military spending, which has received large increases under Trump. He said military spending should be balanced with the federal government’s other responsibilities and that his committee will examine “the right amount of money to spend on the Pentagon,” what national security strategy justifies the spending, and how accountability can be improved. An investigative story published in November in The Nation magazine alleged that Defense Department leaders have been “cooking the books” for decades and perpetrating “an unconstitutional fraud” in financial reports to Congress. Smith said he had been digging into the lack of transparency in military spending, and will continue to do so. “We are absolutely going to bird-dog them to get accurate record-keeping, a full audit that tells us where you’re spending your money and why,” Smith said. He also said he will hold hearings on the decision to send U.S. troops to the Mexican border, a move that Trump critics, including Smith, have attacked as a politicization of the military. A third priority for hearings will be overseas military operations. Smith said he is looking for a better understanding of what collateral damage has resulted from actions such as U.S. airstrikes in Somalia. In U.S. military operations in Syria, Smith said it may make sense to pull ground troops out of Syria, as Trump has said he wants to do. But it appeared that Trump made the decision “by the seat of his pants,” and Smith wants a greater explanation of policy rationale. Smith also plans to delve into the future of U.S. nuclear weaponry. Though the numbers have declined over the years, Smith thinks the current arsenal — which he estimates at more than 4,000 nuclear weapons — could be reduced further. “I don’t think we need as many … My argument is simple. I don’t think we need that many to deter our enemies,” Smith said.